This evening, I had an upswell of shame. I couldn’t help myself. I really like chicken and I can do wonders in one pot. I can’t lie to you, and who am I kidding. I know I said I’d steer away from this trend, but I can’t handle the guilt. I’m going to embrace it. Consider it branding. According to my highly credible market research (The Next Food Network Star), a cook needs to have a point of view. Gimmicks can’t hurt either. Rachel’s got her garbage bowl, and I’ve got my aluminum wok. Are you sick of the photos yet? Food styling is next on the agenda. Exactly a week before payday, I find myself upping the ante. The challenge comes from working with only what’s already stocked. Couple this with a narrow margin to supplement. I’ve been sitting on a can of cannellini beans, so I figured it’s now or never. Coincidentally, I also had a leftover rind from my last wedge of parmesan. Hours I thought I’d lost forever to Everyday Italian seem to be making a comeback. If it weren’t for Giada, I’d never know that salty roundness the rind adds to a nice broth. It may be shaping up springtime, but we’re putting the soup on. I’m hoping to pull some reverse psychology on mama nature and heats things up. 1. 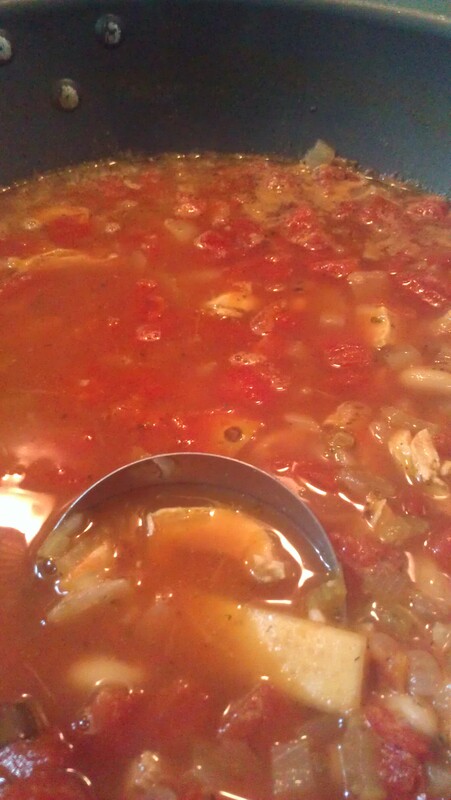 Put water, bouillon, spices and chicken in medium saucepan (oh! It’s not one pot! …busted!) over medium-high heat and bring to a boil. When the mixture is boiling, turn off the heat and cover. Allow to sit about 5-10 minutes and breast pieces should be cooked through. Remove chicken, shred and set aside. 2. Meanwhile, heat oil in an expensive dutch oven (or a flimsy Asian wok). Saute onion and celery until translucent, about 3 minutes. Next, add the garlic. Saute another minute or so until softened, but do not allow the garlic to burn. Add cannellini beans, tomatoes, reserved poaching liquid and rind. Bring the mixture to a boil, then reduce heat and simmer about 15 minutes. Return chicken to pan and simmer for another couple of minutes, then serve. Add salt to taste if needed. Despite having no money in your wallet, there is something wonderful about whipping something up from just what you have. Those are sometimes the most tasty meals! We tend to waste so much because of our gluttonous cravings, when we can actually work with what we have. This sounds superb!